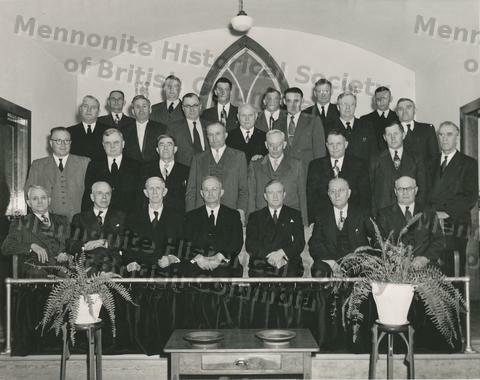 28 members of the Board of Colonization posing on a church choir loft. Back row (left to right): unknown, unknown, unknown, unknown, unknown, unknown. Third row (left to right): H.M. Epp, unknown, unknown, unknown, unknown, A.A. Wiens, unknown. Second row (left to right): unknown, Johann G. Rempel, unknown, unknown, unknown, unknown, unknown, Aaron Toews. First row (left to right): G. Gerbrandt, unknown, B.B. Janz, J.J. Thiessen, unknown, C.A. DeFehr, unknown.